Mental illness is a serious concern for many Muslims living in the United States. In post-9/11 America, Muslims are faced with a complexity of risk factors for developing mental illness. Trauma from migrant country, immigration trauma, and culture shock, all put Muslim Americans mental health in jeopardy. In addition, the backlash of Islamophobia, with a lack of social support, challenges Muslim’s coping abilities. The rise of hate crimes towards Muslim Americans produces fear and anxiety, especially for those without a social network to rely on. Gallup (2009), reported that out of all minority groups in the United States, Muslim Americans are least likely to have positive experiences in life, and have the greatest amount of negative emotions, especially anger and stress (p. 30). Depression and anxiety are the two most common diagnosed mental disorders among Muslim Americans (Herzig & McGrath, 2014). Muslim women are especially susceptible to mental illness. Sexual reproduction and higher rates of sexual assault put females at a greater risk for postpartum depression and post-traumatic stress disorder. Additionally, criticism towards the Muslim woman narrative influences internalized inferiority, resulting in greater amounts of major depressive disorder, eating disorders and suicide (Douki, Ben Zineb, Nacef, & Halbreich, 2007). Further, mental illness in the Muslim world has been stigmatized and shamed, creating huge barriers for Muslim women to receive care. Initially, this research project sought out to answer to question: how do Muslim women at Michigan State University navigate through the United States health care system? With this, the research aimed at discovering ways in which the United States health care system is lacking culturally competent care, and therefore creating a barrier to care for Muslim American women. Through interviews, participant observation and in-depth research, I found the most pressing issue for Muslim women is the barriers to care for issues regarding mental health. Therefore, this essay will focus on stigma and misconceptions, inside and outside the religion, that account for the drastic underuse of mental health services within the American Muslim population. In addition, the changing narrative of Muslim mental health will be examined. My research relies on interviews with three young women at MSU: Hauwa, Aymen and Hiba. Hauwa, a senior studying advertising with a focus in political campaigning, provided me with an observant Muslim perspective. She shared interesting concepts relating mental illness to Islamic faith. Hiba, a sophomore studying interdisciplinary studies in social science, and Aymen, a junior in anthropology, both shared perspectives from South Asain culture. The varying levels of religiousity in these women gave me multiple perspectives on Muslim mental health. Futher, the bulk of obersravations and fieldnotes is contributed to my experience volunteering at the Ninth Annual Muslim Mental Health Conference. Muslims are further encouraged to take care of their health through the importance of personal hygiene. Before afternoon prayer, women gathered in the bathroom of the conference and slowly took off their shoes to begin the cleansing process. Towels were laid out on the bathroom floor for women to wash their exposed body parts, which is repeated before every prayer time. This practice encourages healthy behaviors, as Ali (2014) shares, “hygiene is the study of health and involves practices that promote mental, emotional, and physical health as well as the social well-being of the individuals (Ali, 2014, p. 35). Islam is not only promoting physical health with this practice, but positive mental health benefits as well. These Muslim women understand the influence of psychological processes on the physical body, but this is not always the norm, especially in Muslim populations. Therefore, while many Islamic practices are encouraged for prosperous physical, mental, and spiritual health, the undermining of mental health causes confusion when Muslims fall sick to mental illness. Allah as the source of both health and medicine is shared in this report. Individual’s utilization of God’s creations is a necessity in Islam, which includes the use of mental health treatment. Hauwa mentions that Muslims are expected to follow the rules of the land that they reside on, meaning she accepts Western medicine as it is delivered to her. Despite misconceptions, Islam encourages the strengthening of mental health through prayer and the use of professional resources outside of the religion. Hauwa recognizes how many Muslims view mental illness as a weakness of faith. In addition, she touches on how this belief goes against Islamic faith, because the religions encouragement of help-seeking behaviors for one’s health care. She credits South Asian communities as the source of that stigma surrounding mental health, as this is the identity she holds closest to. Rather than being weak in faith, she states that her community believes those with mental illness are just being lazy. In contrast, Hauwa does not speak much about her Nigerian ancestry, and focuses more on her role as an American Muslim woman. Because of this, she recognizes stigma towards mental illness as subjective to religious misinterpretation. Further, Muslim woman, specifically, must navigate through their multiple identities, and the various stigmas associated with them. The universal narrative of women being overly sensitive restricts individuals from taking their mental health issues seriously. Muslim women are faced with this stigma, in addition to the religious and social shame tied to mental illness. The complexity of identities and social stigmas associated with mental illness create a diverse set of barriers for American Muslim women seeking mental health care. The negative reputation surrounding mental illness interferes with Muslims wanting a career as a mental health professional. There is a lack of Muslim mental health professionals in the United States because of stigma and fear of being associated with mental illness. Dearborn, Michigan is the second-largest Muslim community in the United States, however, according The Institute of Muslim Mental Health directory, only six Muslim mental health professionals are available in the area. This greatly reduces the help-seeking behaviors of Female Muslim Americans, who tend to rely on social networks to receive health care. A family-based health care system was included in all my participants’ preference of care. Social networks essentially guide Aymen to her health care professionals, she shares, “we don’t necessarily research who is the best and go to them. We look at who do we know and who do they know”. The tendency to choose care that is in the community, combined with the lack of Muslim mental health professionals, contributes to poor help-seeking behaviors and establishes culturally incompetent care. Being mindful and respectful is the basis of culturally competent care. Further, providing culturally competent care requires the ability to draw upon cultural and religious beliefs of the patient, to provide them with appropriate care (Ahmed & Reddy, 2007). Speaking about the necessity of culturally competency in mental health care, “you cannot talk about a person’s wellbeing while taking out a part of their identity” (Keshavarzi, 2017). Knowledge about an individual’s various identities plays a vital role in communication and care in the health field. However, misunderstandings about Islamic practices, combined with a lack of Muslim mental health professionals, produces a system of mental health care in the United States that is not appropriate for comprehensive care. Misdiagnosis of mental disorders in Muslim patients is a consequence of culturally incompetent care. Hooman Keshavarzi shares a story about a Muslim woman being misdiagnosed with obsessive-compulsive disorder (OCD). The psychologist did not understand the importance Islam places on personal hygiene, and misread her hand-washing rituals as a symptom of OCD. After observing the washing ritual for the first time at the conference, I can understand the source of confusion for an uninformed psychologist. However, the goal of culturally competent care is to avoid these huge mistakes, and in return, have a system of care that is more accessible to Muslim culture. The Muslim Mental Health Conference was first created in 2008 by Dr. Farah Abbasi. In a recent interview, Dr. Abbasi shares why she felt the conference needed to be created, “what I was realizing was that many were not acknowledging, accepting or accessing it (mental health care). I was seeing the same issues happening within the community but there was the deep shame, silence, and stigma and people were just suffering and not wanting to do anything, or not even sure what to do about it” (Stateside Staff, 2017). Since the creation, the conference is held annually and features a new theme of mental health issues facing Muslim communities each year. This year’s theme focused on substance abuse issues in Muslim populations. This extremely controversial subject displays the expanding field of Muslim mental health care. Slowly, Dr. Abbasi has seen a change in the narrative of Muslim mental health, and states that the psychiatric community has finally began to accept that faith plays an integral role in an individual’s resiliency (Stateside Staff, 2017). Flyer for Faith and Community Leader Training at the Muslim Mental Health Conference. Participants worked together to create ways to improve on culturally competent care for Muslim communities. Aymen believes her role as a first-generation American woman is to encourage other Muslim women’s agency towards mental health care. Acceptance towards Muslim mental health is strongly driven by these first-generation American Muslim women. Demographics of this year’s Muslim Mental Health Conference was composed of 96% female attendees. Additionally, five of the six Muslim mental health professionals in Dearborn, Michigan are women. These numbers display the agency of Muslim women to change the narrative of Muslim mental health. To generate change within the religion, this participant encourages Muslim women to re-educate themselves on Islamic beliefs. Going back to the “roots” of Islam will also help remove negative connotations towards Muslim mental health. To do this, speaking about mental illness through education with open conversations is key. She noted her ability to create a depression diagnosis for prophet Jacob, who was “so sad over Yusuf Surah that he went blind”. The use of stories within Islam can be extremely beneficial for Imam’s to encourage Muslims to seek professional mental health care. Collaborative mental health care can be established with the use of these stories. Collaborative care is a term used often throughout the conference. Relationships between Imam’s and mental health care professionals are vital for culturally competent care. During the conference, one speaker looked around the room and noted, “It is nice seeing physicians in the crowd because often those two are seen separately. Imams need to reach out to professionals instead of relying on themselves to help with mental health issues”. As Imams are becoming more aware about the seriousness of mental illness, they starting to encourage more outside care. An Imam at the conference shared that when Muslims come to him with mental health issues he shares a list of mental health professionals that he is confident will provide culturally competent care. This strategy is excellent for promoting the use of professional mental health care. Another evolving role of the Imam is educating mental health providers on culturally specific values, which requires a great collaborative effort on both parts. 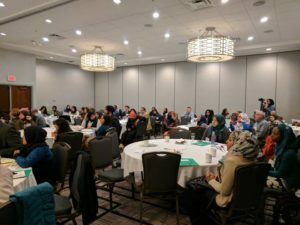 Interactions between Imams, Muslim health professionals, and non-Muslim professionals during the Muslim Mental Health Conference gives optimism to the changing narrative of Muslim mental health. Through my research, Islam was exposed as an excellent guide for healthy life-style choices. If followed as intended, Islam promotes healthy practices and positive health-seeking behaviors. However, issues occur when religious obligations are misinterpreted. Specifically, shame towards mental illness is produced through various outlets within the Muslim world, and through outsider’s misconceptions of Islam. Mutiple barriers to care are established in Muslim communities including: stigmatization of mental illness, a lack of Muslim mental health care professionals, and culturally incompetent care, just to name a few. As a result, mental health issues are often undermined and go untreated, resulting in a distraught community of Muslim American women. However, my research found that agency in Muslim women in the United States is shifting the narrative of Muslim mental health. Through my interviews and participation at the Ninth Annual Muslim Mental Health Conference, I found that first-generation Muslim American females are currently working towards removing the barriers to mental health care in the Muslim world. This was by far the most significant finding in my research, as a fair amount of research has displayed the barriers to care, but not measured the ways in which care is actually being improved. This research provides interesting suggestions, created by participants of the conference, that aid in the development of collaborative care. Rather than separating religion and mental health, these young women all suggested increasing intergration between the two subjects. This will not only create culturally competent care, but will make Muslim American patients more understanding and comfertable with the field of Muslim mental health. Knowledge, agency and identiy are all themes I found throught my research. Knoweldge about Islamic practices and obligations, that actually encourage healthy practices and help-seeking behaviors, was an important concept that my participants wanted to share. Specifically, Hauwa encouraged the idea of being knowledgabele about your religion in order to have agency to fight against the misconceptions. Agency was a theme found within all my participants, and shared often throughout the conference. Using agency to combat stigma towards mental health, instead of avoding uncomfortable situations, was emphasized as a way to improve cultural competenet care. Lastly, identity played a huge role in all pariticpants views of mental health and barriers to mental health care. The various identies held seemed to push Muslim American women to become somewhat defencive towards their values and understanding of Muslim mental heath. This has aided the changing narrative of Muslim mental health, which is countinuly growing as a important subject in the field of mental health care and in Muslim communities. Overall, this experience as an ethnographic resaearcher enabled me to step out of my comfort zone and get involved in the Muslim community at Michigan State Unviersity. This fulfilling experience provided me with an overwhelming amount of information. I expect to continue research within this subject so I can further develop my understanding of Muslim mental health. Lastly, my work in this field has provided me with the confiendence to attend other scholarly conferences. My time spent volunteering at the Muslim Mental Health Conference was not only helpful for my research, but also for the development of my future career. I found myself becoming increasily interesting in the field of social work. I look forward to using the interview and obersvation skills gained throughout this process as I gradute from Michigan State University, and move on to higher education and jobs. Ahmed, S., & Reddy, L. (2007). Understanding the Mental Health Needs of American Muslims: Recommendations and Considerations for Practice. Journal of Multicultural Conseling and Development, 35(4), 207–218. Aneesah Nadir, & Cheryl El-Amin. (2017, April). Workshop: Contemporary Issues in Mental and Behavioral Health Facing American Muslim Families. Presented at the Ninth Annual Muslim Mental Health Conference, East Lansing Marriott at University Place. Aymen A. (2017, March 15). [Audio Recording]. Hauwa Abbas. (2017, March 27). [Audio Recording]. Hiba Abdullah. (2017, March 26). [Audio Recording]. Imam Sohail Chaudhry. (2017, April). Presented at the Ninth Annual Muslim Mental Health Conference, East Lansing Marriott at University Place. Keshavarzi, H. (2017, April). 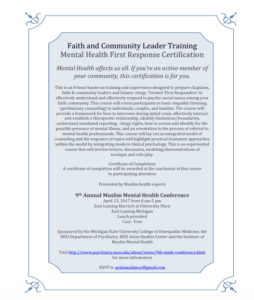 Faith & Community Leader Mental Health First Response Certification Training. Presented at the Ninth Annual Muslim Mental Health Conference, East Lansing Marriott at University Place. Qureshi, A., & Bhat, A. (2013). Significance of Personal Hygiene for Islamic Perspective. IOSR Journal Of Humanities and Social Science, 10(5), 35–39.